Monolingual: Many communities are realizing the benefits of offering storytimes completely in a non-majority language that is spoken in the community. These storytimes have the two-fold benefit of a) offering literacy support to families who speak a non-community home language and b) offering children who only speak the community language the opportunity to be immersed in a second language. Although these storytimes may be labeled “bilingual,” they are actually conducted solely in the target language. The assumption is that the target audience can understand what is being read without any need for translation or explanation in the community language. Usually bilingual books or books in the target language are used during these storytimes and the discussions that take place around the books are done only in the target language. While parents may be eager to bring their children who don’t speak the target language to a storytime like this (to help their children learn the language), it may not be the best idea. A child who doesn’t understand anything that is being read may actually become frustrated and bored and resist attending in the future. Bilingual Mixed: Usually when a storytime is labeled “bilingual” it means that the audience can speak the community language very well but may or may not speak the target language well. These storytimes are often conducted in English but the book is read out loud in a different target language. The presenter may stop at consistent intervals to make sure that children understand what has been read so far (explaining confusing parts in English) before continuing. The benefit of these storytimes is that families with many different language skill levels can participate. These storytimes also provide children with the opportunity to start learning bits of a new language. For families who are fluent in the target language, these storytimes may be boring due to the large amount of English that is spoken. Back and Forth: Recently Multilingual Living shared a post that explained a storytime that follows a more “back and forth” approach. In this storytime, one page is read out loud in one language and then the same page is read out loud in the second language. This back and forth continues until the book is completed. (See the Multilingual Living post for a video that shows how this is done). Ideally the page is first read in the non-community language since this will give the children the opportunity to form meaning in the target language before they hear the community language version. The benefit of this kind of storytime is that children are given the opportunity to learn a new language without being frustrated by only understanding very little (which can take place in the monolingual example above). The immediate reading in the community language gives children the opportunity to link words and meanings in both languages. One After the Other: Another approach to bilingual storytime is to read an entire book out loud in the target language and to then read it again in the community language. As with example #3 above, children who are monolingual in one or the other language will benefit from a storytime like this since they are bound to understand at least one reading of the story well. Bilingual books are wonderful for this kind of storytime since the reader(s) can use one book for both readings. Either the same person may read the story each time or two people can do it, each reading in their native language. Interactive: A very popular storytime is one that includes a lot of movement and singing. These storytimes can follow any of the 4 examples above: A mixture of the community language and the target language or completely in the target language. Ideally, however, the songs or movement directions will be done completely in the target language. Providing children with complete sentences in the target language is ideal since this is the way our brain learns language most naturally. Best are songs and movement activities that are easy for children to learn since there is nothing more frustrating for a child than struggling to follow along to a complex song or string of movements. Bilingual books such as, Head, Shoulders, Knees and Toes and Row, Row, Row Your Boat are wonderful for this kind of storytime! Regardless of how a storytime is conducted, the focus should be on children having fun and feeling joyful. To ensure that children feel comfortable at storytime, they should not be made to participate in activities or answer questions if they do not want to. Some children will take time to open up, so be patient with them. Before you know it, a quiet child will be calling out responses to the books and may be the first to sing out loud during the interactive activities. Storytimes are such a wonderful way to share the magic of language with children! 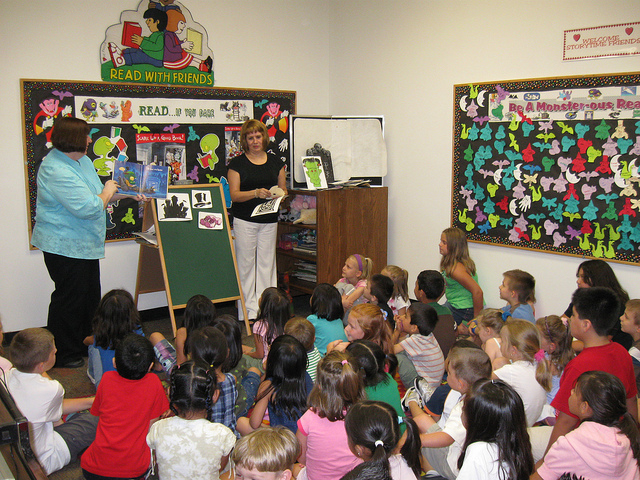 Do you have storytime at your school or local library? What approach do you think is best when it comes to storytime for bilingual and/or English Language Learner children your classroom, school and/or community? This is a great classification of the types of story times. Children should know about these 5 types of story times at their school and we should learn about these story times at our community. Its important. Hi and thanks for reposting my ideas via the Multilingual Living article. I’m glad to use your forum to spread the ideas since the main goal of the article is to share ideas with other parents looking for activities in their language! greetings from Lille! Bilingual teaching is important for learners to understand the objectives you want them to acquire. Using bilingual language is effective and must be supported. has a lot of moisturizer in it.